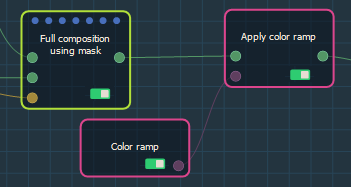 This node applies a color ramp to a terrain by linking the terrain node to the Color ramp node. To add a node, right click in the Graph Editor and select Create Node > Color > Apply color ramp. This node links to a color ramp node to apply a color ramp to a terrain. Terrain displayed with the default color ramp, then with a custom color ramp.